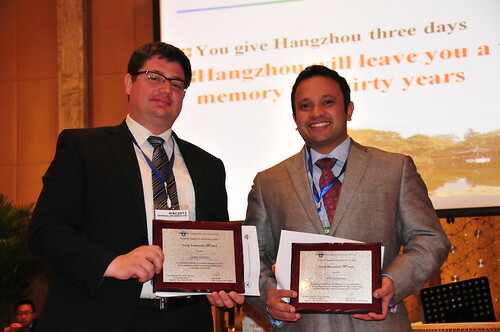 Abu (right) accepting the IFAC Award. Something about me: I’ve lived on four different continents for at least three years including India (Asia), Nigeria (Africa), the state of Iowa in the U.S. (North America) and Switzerland (Europe). Focus: Dynamics, modeling and control at the nanometer scale. Nanotechnology was an emerging area when I was starting my PhD. We found that control and system-theoretic concepts can play a key role in addressing some of the challenging problems in the area. That is how I got into this field of research. The multi-disciplinary nature of the research as well as the strong experimental component makes it particularly attractive. If I have to predict the future, I see great potential for a memory element to serve simultaneously as both memory and logic, or even as component of a non-von-Neumann neuromorphic computing hardware. Career Advice: The current multi-disciplinary nature of research demands a diverse background. For example, during my studies I focused my attentions in math, physics, systems theory and engineering. What’s New: Abu was recently awarded the International Federation of Automatic Control’s Young Researcher Award for 2013. The award is presented triennially to a researcher who is 40 years or younger (on the first of March of the year of the award), who has an established a history of participation in and contributions to IFAC mechatronic systems activities, and who has demonstrated outstanding research contributions in mechatronics, either of a fundamental or applied nature. Connect with Abu on LinkedIn.